Fritz's children Madeleine and Sven (left) both delivered brilliant and emotional speeches at the book party in memory of their father. There, they met Alain Blaikley for the first time, who arrived for the reception from London and was a longtime friend of Fritz Kraemer’s brother who lived in the U.K.
Ladies and gentlemen, please let me welcome you to the presentation of Fritz Kraemer on Excellence ! Today, and later while reading this book in the comfort of your home, I invite you to join me on a journey to an almost forgotten world—a world of values, principles, and ideals. The world of a missionary, a gifted mentor, and a Pentagon strategist! The re-election of George Bush, so surprising for many, shows just how great the desire of millions of people actually is for orientation and moral values. And it also shows that elections can be won on this basis. For the next 30 minutes let us forget about Michael Moore! 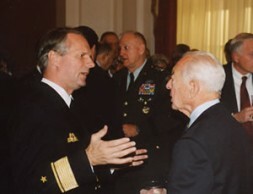 Madeleine (left) greets American hero, Ambassador, and Lieutenant General (Ret.) 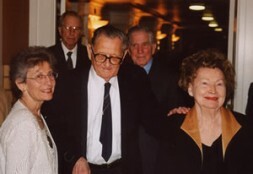 Ed Rowny (center) and his wife, who spoke about Old Fritz and contributed to the new book. He is a Member of the International Advisory Board of World Security Network. Enter the world of a last Prussian who demanded passion, sacrifice, honor, and duty. Which code of honor one pursues is important, not material riches. What is important is not pure power and career, but inner independence and personal courage. Voters aren’t only driven by their wallets; they also long for absolute—non-material—values. Being overly intellectual and overly educated leads to a loss of reality. Be an independent person and say what you think, work to form reality and take on tasks for society. Fritz Kraemer observed a spiritual vacuum in our highly developed democracies—a soulless society, which is rich and fat, and has therefore become soulless and unwilling to sacrifice for the community. Admiral Hubertus von Puttkamer, Defense Attaché at the German Embassy in Washington DC, discussing the values and aphorisms of Fritz Kraemer. 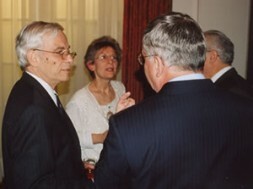 Kraemer, who was born in Germany, helped to liberate his former Heimat from the Nazi totalitarians as an American soldier and to defend it within the NATO alliance against the threat of the Soviet Union for over 30 years as strategic advisor in the Pentagon. People who “know it all” but understand nothing. And the intellectuals that can argue over everything and nothing, pro and contra, right and left or exactly the opposite. Essential values such as dependability, responsibility, and honor can’t originate from intellectual thinking, but from faith alone. Let’s be honest with each other, don’t feelings move us more than material things? Don’t worldly possessions in fact produce pleasant feelings? Don’t many in this room feel the need for a satisfying—perhaps even a missionary task—that brings satisfaction precisely because we do so well materially? Kraemer expects of the professional managers in politics an “internal fire,” courage, and a portion of adventurousness—and above all an “inner musicality” and independence. A statesman should—if necessary—sacrifice his career to remain true to his heartfelt convictions. Kraemer was an enthusiastic and gifted “talent scout.” In 1944, he discovered Henry Kissinger, who like himself was an emigrant from Germany, and supported and developed him for 30 years. Kraemer, as Kissinger states in this book, was the greatest single influence during his formative years, and will be a part of his life as long as he lives. In the early 70s, Kraemer placed a young lieutenant colonel next to his protégé Kissinger: Alexander Haig, who went on to become Secretary of State in the Cabinet of Ronald Regan, and is also a contributor to this book. For 25 years, I listened to my guru, Fritz Kraemer, for nights on end. After hours of listening, an almost metaphysical power came over the heart and mind, a power that encouraged a young, unformed person to follow his values and ideals. I compare this to a computer program which, over years, was transferred onto empty hard drives—window washing by Fritz Kraemer, so to speak. Kraemer’s central concern was urging people to “look for men and women of excellence.” Encourage, develop, and support young people so that they will become a responsible elite in all aspects of life and do great things for society. This is the motto and goal to which this new book Fritz Kraemer on Excellence is dedicated, which you can purchase only here as a limited first edition. The World Security Network Foundation, which I founded in New York, is also dedicated to this goal. 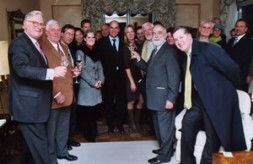 It is a network of the info-elite in foreign and security policy. Each week our newsletter, the largest of its kind dealing with analyses of foreign and security policy in the world, goes out to 160,000 readers, of which 45,000 are professors and alumni of elite universities; 36,000 businessmen and women; 32,000 journalists; and 15,000 experts and politicians. With its scholarship program, WSN supports young people, who get to know decision makers in American politics in New York and Washington. The recipient of this year’s scholarship was Dmitry Udalov, a nineteen-year-old whiz kid from Moscow. Together with 8 research institutions, we are developing “Codes of Tolerance” to support a cooperative partnership of the cultures of the world. Tonight, I would kindly ask you to support our work by purchasing the book Fritz Kraemer on Excellence.